Hyperion Edge: Tron #65, "Tron confronts guards on the approach to the I/O Tower." 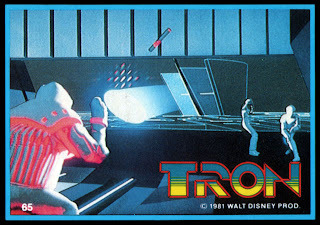 Tron #65, "Tron confronts guards on the approach to the I/O Tower." Tron Sticker #5, "I/O Tower"
Tron Sticker #4, "Light Cycles"
Tron Sticker #1, "Tank Maze"
Tron #64, "Sark's Carrier begins to de-rez." Tron #63, "Clu is interrogated by the MCP." Tron #61, "Sark on the Lightcycle grid." Tron #60, "Sark captures Dumont, Yori and Flynn." Tron #59, "Sark's Command Deck." Tron #58, "Blue Light Cycle"
Tron #57, "Tower Guardian Dumont"
Tron #55, "Interior of Clu's Tank"
Tron #54, "Prisoners of the MCP"
Tron #52, "Yori on the de-rezed carrier." Tron #51, "Tron Movie Poster"
Tron #50, "Pod Exits Carrier sequence, Frame 84"
Tron #48, "Flynn's stolen recognizer." Tron #47, "Yori and Flynn"
Tron #45, "Tron in a 4 on 1 match." Tron #43, "The Master Control Program"
Tron #42, "Clu closes in on a Recognizer." Tron #41, "Tron on the Lightcycle grid."